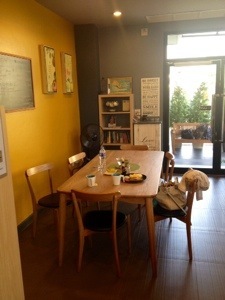 I spent a night at The Hub arranged by my Thai friend. I bunked in with another three Thai friends who came from another city seven hours drive away. Tucked in a little street off the main road, the car pulled up at a new 38-units building that provides short-term and long-term residences. Even in the night light, the Hub extended an invitation of rest and refreshment with the scripture on the wall, “I will enter His gates with thanksgiving”. 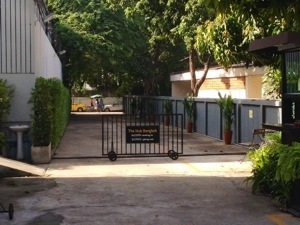 The Hub is a residence with conference facilities for small groups of 10-100. It is for the Christian community. 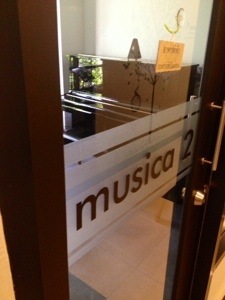 The first thought that came to my mind when I stepped into the building was “a dream come true”. After chatting with one of the founders Deborah, truly this is a project of faith. It defies logic to have a residence in Thailand for Christians when the percentage of Christians is so low. As its name suggests, the Hub is more about community than a business venture. An oasis, a watering hole and a resting nest for believers. 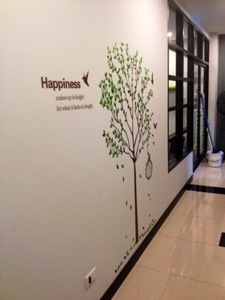 Every corner of the common areas reflects God’s beauty and love. The attention to details and aesthetics conveys love and warmth to the guests. 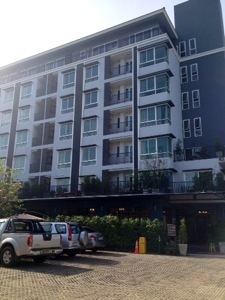 The Hub has a boutique hotel feel with the cosiness of a home. I was in a 2-bedroom unit. A queen-size bed in one and a single in another. Another single bed is placed is an enclave in the common area that is almost like another room without a door. 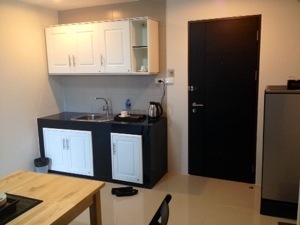 The rooms are basic yet done up tastefully with simple lines and colors. One thing I must mention, the mattresses are of the right firmness (at least to me) for a good night’s rest. There are no cooking facilities but the pantry and dining area are great space to chill and enjoy the company of friends & family. 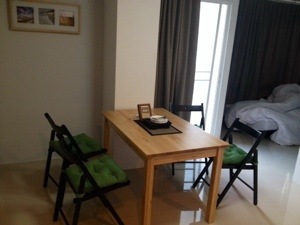 A simple yet inviting dining area in the 2-Bedroom unit. 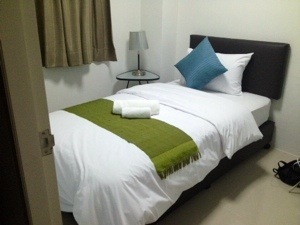 The single bed in the “enclave” is on the right. The bedroom with single bed in the 2-bedroom unit. The mattress is very comfortable! 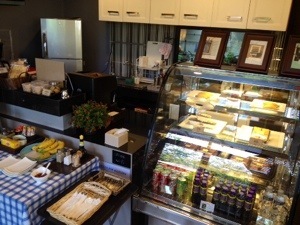 The cafe for breakfast has to be mentioned! The deco with inspirational art works and creative details, coupled with a well balanced mix of natural and perky colors is a good place to start the day. 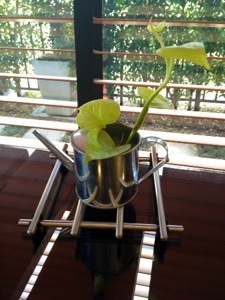 Although breakfast is not included in the room rates, it is worth enjoying the first meal of the day looking out at their little garden. My breakfast table for that morning! 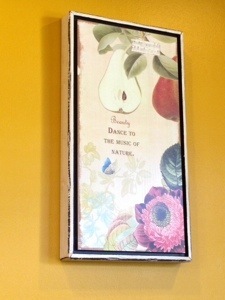 Love the yellow wall and deco. 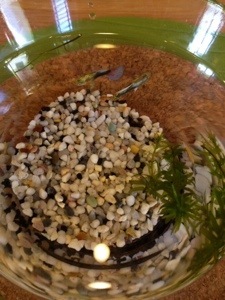 A glass bowl home to two little fishes on the dining table of Garvet. 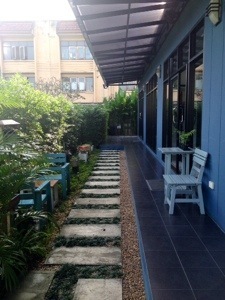 The Hub has a little garden in its backyard with thoughtful and pretty spaces. I would love to read the Bible and pray in the morning here. Well, I didn’t get a chance to as I had to rush off after breakfast. 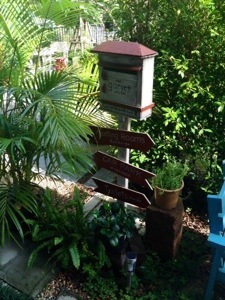 Directional signs so I won’t get lost! 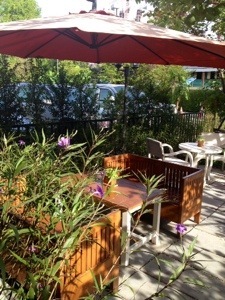 Breakfast in the garden to enjoy the warmth of the sun? 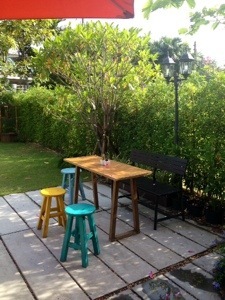 Simple stools and table in the garden to chill at sunset! Wooden swing chair in the garden makes it so idyllic… Nice! Here’s a peep into their conference facilities. The big room holds about 100 people theatre style sitting, with a stage area equipped with sound and lights! 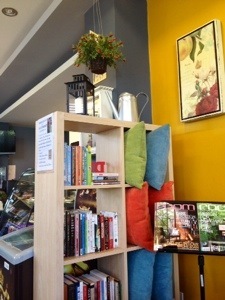 The smaller rooms are great for small group meetings. 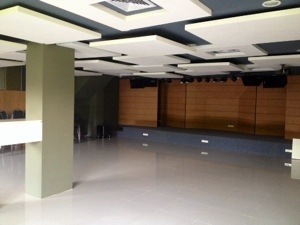 The function room that holds about 100-120 theatre-style with a stage area equipped with sound and lights! 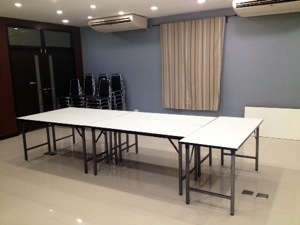 Smaller conference rooms that is great for smaller groups, equipped with projector screen and projector. 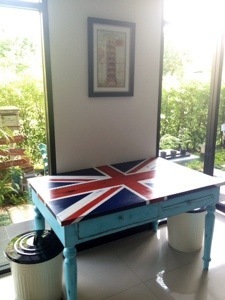 Table just outside the conference rooms… for tea break!? 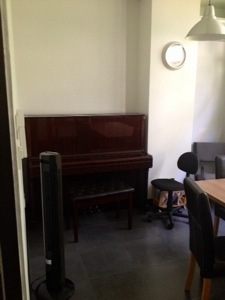 One KEY thing I love about The Hub is their music rooms with a piano each! 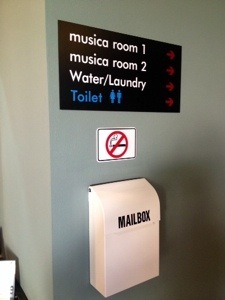 It is almost impossible for a pianist or keyboardist to have our instrument with us when we travel. These two rooms are a gem! Maybe if there are some guitar and bass amps, and possibly a drum set will be a dream hotel for worship bands. 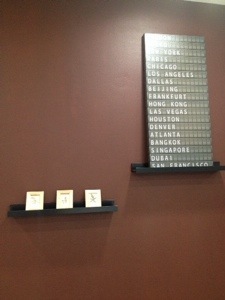 Signs on the walls near the reception area of The Hub. Yes, you can do your own laundry using one of a few washing machines available. 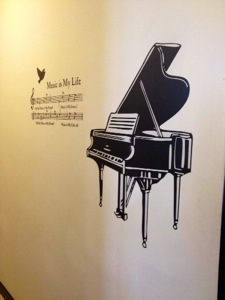 Mural just outside of the Music Rooms! You must be wondering what are the rates of The Hub. 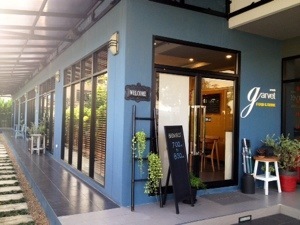 The room rates start from 800baht for single/twin room to 1800baht for two bedroom suite. They have monthly and yearly rates for these rooms too. Although it is not located within the city centre of Bangkok, it is 7-12min taxi ride from Ramkamhaeong Station of the airport rail. If you do not have much luggage, it is only about 15-20min walk from the station. It takes about 30 min by taxi to the city, depending on traffic. 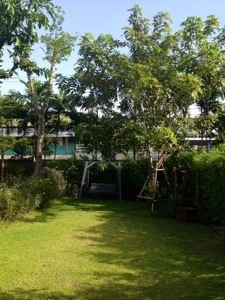 Here’s a little upcoming news, they are planning to build a small swimming pool next to the garden! 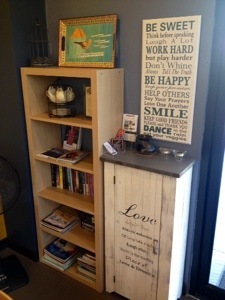 Apologies for the simple photos on my iPhone that do not do full justice to the love and thoughts put into the design of The Hub during my speedy-Gonzales stay at The Hub.